“I used to eat at Crustacean’s Diner, but lately, there seem to be nothing but mussels hanging around,” said Finlay. “Look at the line, will you. Everyone who’s anyone is here tonight. I’m glad we came early and are first in line,” Reins said. Just then three sharks swam by. Reins and Finlay watched as they swam back and forth, their teeth fully exposed in a snarl. A tiger shark named Stripes swam over to Finlay and Reins. “You two are first in line for Fins I see, or should I say you were the first in line. Not now, you’re not. Come on Nails and Coral,” Stripes said. A hammerhead and a reef shark swam over. “We’re first in line now.” He pushed Finlay and Reins out of the way. Reins flew through the sea and landed deep in the sand. Finlay, who was three times the size of the sharks, opened his mouth to protest. Nails put his snout next to Finlay’s eyes. Slowly he opened his mouth. Rows of sharp, jagged teeth with bits of fish flesh stared Finlay in the face. “Got a problem?” he said. Finlay was about to say something back when Reins tugged at his fin. “Let them be first in line. It isn’t that big of a deal,” the seahorse said. Coral swam back to Maine. “What did you just say, you puny lobster? Did I hear you call us bullies?” Coral snapped her jaws open and shut. Looking at the rest of the customers waiting in the line, she said, “Let this be an example to you all. Anyone who calls us names, pays the price.” She grabbed Maine with her fin and swam up to the other sharks. “Here’s an appetizer for you,” she said, handing the squirming lobster to Stripes. Nails, Coral, and Stripes pushed Aster out of the way and went inside. They picked the table they wanted without waiting to be seated. Reins and Finlay sat at a table near the sharks. None of the other customers would sit that close to them. “Let them eat, Finlay. They’re just feeling a little rambunctious tonight, that’s all. 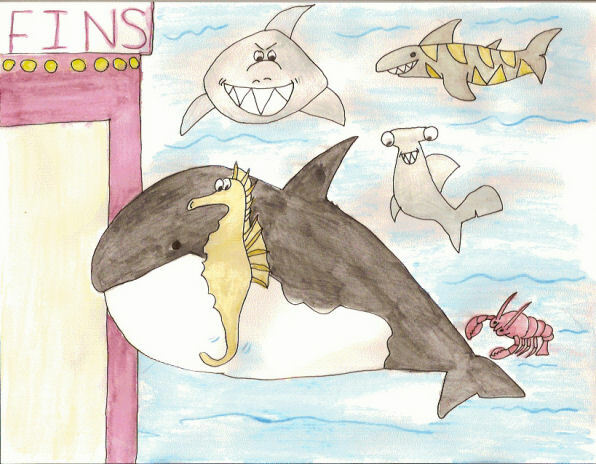 Everyone’s excited about coming to Fins, even the sharks,” the seahorse said to his friend. Finlay watched as the sharks tossed salt at the sea slugs, tried to pickle the sea cucumbers in vinegar and put sand in the oyster’s shells, but when they tripped the octopus, he threw his napkin down on the table and stood up. His arms were full of plates for the other customers. The other sharks laughed so loud that the dishes on the table bounced up and down. The octopus sat on the floor, covered in kelp stew, anemone casserole and pate de sponge. He towered over the sharks and started singing. The sharks, who at first had felt a bit afraid, started to laugh. “Oh, isn’t that nice. The whale’s singing us a song. La la la to you, Finlay.” Stripes rolled on the floor, holding his dorsal fin and laughing. Coral giggled and swallowed an entire platter of gumbo, platter included. The sharks stopped laughing. There were four whales now and all of them much bigger than they. “I think it’s time you sharks left. Fins doesn’t want garbage inside the restaurant. It’s kept out back.” Finlay puffed himself full of air and aimed his blowhole at the three sharks. He blew as hard as he could. The other whales did the same. Nails, Coral and Stripes were blown through the back door and out into the alley behind the restaurant. The sharks didn’t think it was funny any more. They swam away into the dark depths of the sea. “Now, let’s go back inside and have a nice meal,” Baleen said. When they went into the dining room all the sea creatures clapped their fins and claws together. The whales bowed and sat down next to Reins. “How about a platter of that krill…no, make it four platters, and bring extra sweet and sour sauce,” Finlay said. That night was a huge success for Fins. Everyone enjoyed their meal and never again were the sharks allowed in. They never tried. Finlay and his friends got jobs as bouncers and had all the krill platters they wanted from then on.